The Ford Fusion Energi is a comfortable car, with good looks and ample room front and back, that happens to have an electrified drive train offering 21 miles of electric-only range. On Wednesday, in San Francisco, Ford had the first media drive event for Fusion Energi allowing journalists their first opportunity for time behind the wheel.. The 2013 Ford Fusion is the first of Ford's vehicles to get almost the full "Power of Choice" treatment. What that means is, the Fusion is available with a normally aspirated gasoline engine, or a EcoBoost gasoline engine, or a normal Hybrid drive train, or a plug-in Hybrid drive train, but not an all-electric drive train. In Ford's mind, the customer base deserves a choice between drive trains. They've designed things such that the drive train is now a configurable choice during the purchasing process, and at the factory magic is performed to enable manufacturing cars with the customers chosen drive train. The Fusion Energi is one leg of a multi-pronged strategy by Ford to gain market share from Toyota and Honda. The strategy is reportedly having success, already, with Ford's hybrid vehicles beginning to take market share away from Toyota. However, the company has not broken out sales sufficiently to let us know the sales rate of the plug-in hybrid Energi models. This means that the 2013 Ford Fusion Energi is for almost all intents the same as the gasoline or hybrid powered versions. It is the same car in the passenger cabin and exterior design. For example the seating was comfortable, the infotainment system is modern, and so on. The primary differences owners will see are that some trunk space was sacrificed to the battery pack, the dashboard has a few new behaviors, and there is a port for charging the battery pack. While we were unable to take the car on the highway, it being San Francisco we were able to test its hill climbing ability. Performance on both flat ground and hill climbing was impressive, and we were able to accelerate up Nob Hill with no problem. Handling was great, and the car easily threaded its way through city traffic. The Fusion Energi offers three electric driving modes: Auto EV (normal hybrid, plus automated selection of EV mode), EV Now (strongly prefers electric drive, and kicks the gas engine in when needed), and EV Later (which preserves electric mode for "later"). These modes are selected by a button on the central console. That button is a little difficult to find, but once you learn where its' location switching these modes becomes natural. An interesting choice of the Ford electrified cars is a coaching assistant on the dashboard. This feature educates drivers on the ABC's of driving efficiently, namely efficient Acceleration, Braking and Cruising. (get it? ABC?) The coach appears in the left hand side of the dashboard, with some of the display modes giving quite a bit of information about energy consumption. During braking there is a display indicating that regenerative braking is active, and once you reach zero miles/hr (full stop) the braking coach gives you a score of up to 100% regenerative braking efficiency. The higher the score the more energy you recaptured through regenerative braking. Another coaching mode shows a vine that grows and loses leaves through acceleration and cruising habits. In EV mode the car is electronically limited to 85 miles/hr top speed. A Ford engineer explained this serves the purpose of extending total driving range, by limiting the top end energy consumption. When the gasoline engine is active the top speed is a fair bit higher. Because it was a short test drive we weren't able to test the range or charging time of the Fusion Energi. It easily handled jaunting back and forth across San Francisco, and there was very little to be concerned about due to the electric-only range because the gas engine kicks in once the pack is depleted. The electric-only range of 21 miles is more than double the electric-only range of the Toyota Prius Plug-in and the Honda Accord Plug-in Hybrid. The 21 mile electric range means that, on average, the driver will bring some gasoline every day unless they can charge the battery pack while away from home. Why? Because, on average, typical drivers travel 40ish miles a day. Charging at work or shopping centers would enable a full day of electric driving. Owners of the Prius Plug-in and Accord Plug-in Hybrid will have a harder time doing so because of the shorter electric-only range offered by those cars. As for "fuel efficiency", we were unable to verify much with such a short drive (there are questions about the accuracy of the EPA fuel efficiency ratings on Ford hybrid's). The dashboard does include a display showing a miles/gallon number. In one leg of the trip, driving up a steep San Francisco hill. that gauge showed 48 miles/gallon efficiency, while a later leg of the trip on flatter ground showed a fuel efficiency above 85 miles/gallon. For most of the trip the gas engine did not kick in, and the high fuel efficiency will have come from two effects. First, driving downhill gives a great opportunity to recapture energy through regenerative braking. Second, electric drive mode is innately more efficient than gasoline. 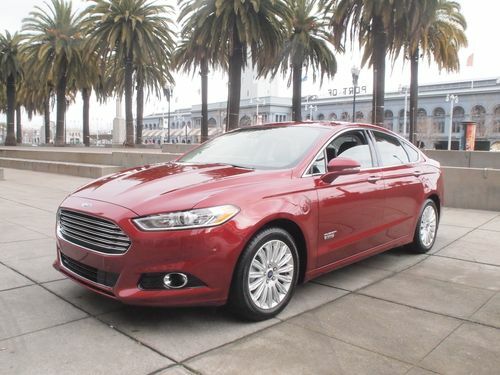 The Fusion Energi SE has a starting MSRP of $38,700 and, according to Ford's website, there is a $355 lease offer. This is in the ballpark of the 2013 Chevy Volt (MSRP $39,145), however the price of both is quite a bit above that of the all electric 2013 Nissan Leaf. Nissan's move to drop the price of the Leaf has made for an interesting dynamic in the electrified car market, and one wonders what the impact will be on Ford's success. The Ford Fusion Energi is a good looking car with all the creature comforts you'd expect from a modern car from Ford. It offers the driver an excellent electric driving experience that theoretically will enable driving without electricity most of the time. The electric driving experience is blended well enough with the car that a driver could operate the Fusion Energi exactly as they do a gasoline car, and still achieve good fuel efficiency gains, while the electrically driven side should enable even more. You should do some research prior to making ignorant comments. You live in Maine? So I assume your temperature is below 40 degrees???? well take 10-15% off your MPG right there. Fuel? I assume you are not using 100% fuel right? Winter fuel will lower MPG by 5%. Do you have under than 3500 miles on your car? Theres another 3%. Do you even know how to drive a hybrid? That will make a difference also. A hybrid is very sensitive to a lot of factors. So if you live in So California, you will probably get 45-50 MPG. Why don't you get on the C-Max Forums, read what other drivers are getting. Those in warmer climates are doing just fine. So get out of YOUR world, and know that there is another one out there.